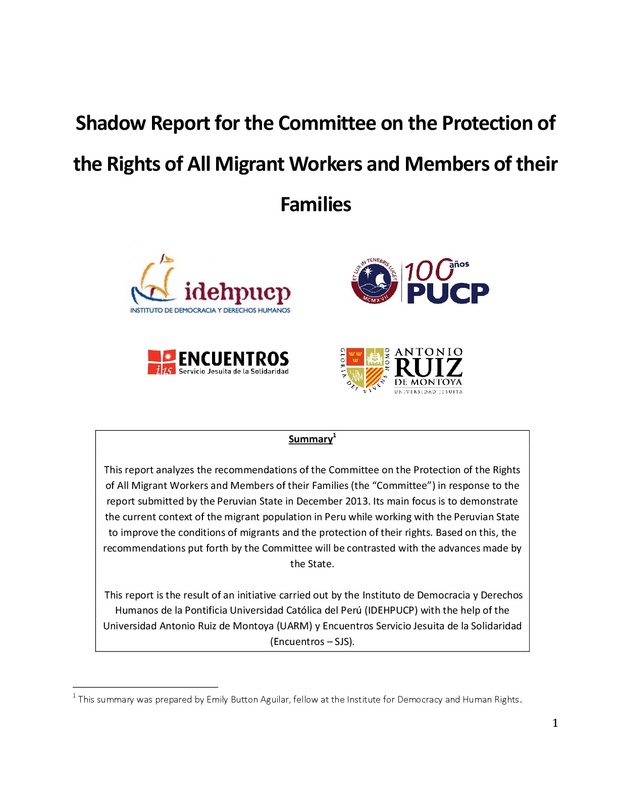 This report analyzes the recommendations of the Committee on the Protection of the Rights of All Migrant Workers and Members of their Families (the “Committee”) in response to the report submitted by the Peruvian State in December 2013. Its main focus is to demonstrate the current context of the migrant population in Peru while working with the Peruvian State to improve the conditions of migrants and the protection of their rights. Based on this, the recommendations put forth by the Committee will be contrasted with the advances made by the State. This report is the result of an initiative carried out by the Instituto de Democracia y Derechos Humanos de la Pontificia Universidad Católica del Perú (IDEHPUCP) with the help of the Universidad Antonio Ruiz de Montoya (UARM) y Encuentros Servicio Jesuita de la Solidaridad (Encuentros – SJS).